In January 2014, the Heritage Lottery Fund and the Big Lottery Fund awarded a grant of £2.45m to restore and improve Wharton Park. With additional funding from Durham County Council, Durham Area Action Partnership and other sources, a total of £3m was made available to cover major works in the park. “We’re really pleased work is now starting to renovate the much-loved Wharton Park. HLF’s investment will go a long way to unlock its potential so it can be restored and opened up for local people to enjoy. Lottery funding continues to provide an essential source of investment for our parks and is ensuring that they remain at the heart of their local communities." The project to improve and restore Wharton Park began with the appointment of award-winning landscape architects Southern Green Ltd leading the design work. North-East based Southern Green are specialists in park restoration and have been responsible for successfully delivering many projects in the region and across the UK. Initial work on the regeneration of the park began in February 2015. The former park keeper’s house was demolished and ground clearance around the battery was carried out by local pupils from Framwellgate Moor as part of the Haggrid Project - a joint scheme by Durham Police and the Durham Agency Against Crime to promote personal development through horticultural, environmental and community skills. Durham County Council appointed Esh Construction Ltd as the main contractors for the regeneration of the park. Major on-site works began in May 2015. These works involved both constructing brand new facilities and refurbishing existing features. The new facilities included a heritage centre with room for internal events, a cafe and toilets. the contractors also constructed two new play areas, an outdoor gym and a community garden. Existing features that were were refurbished included the battery, the amphitheatre and the miniature car track. In addition to these major on-site works, the contractors also undertook a variety of other tasks including changes and improvements to park entrances and car parking, repair and restoration of statutes and improvements to paths, signage, walls and soft landscaping. On 23rd May 2016, the Friends of Wharton Park were awarded the Chairman's Medal by Cllr Jan Blakey, then Chairman of Durham County Council. The award was for our invaluable contribution to the regeneration project. Wharton Park was officially reopened by HRH the Duke of Kent on 7th October 2016. On 11th November 2016, Wharton Park won no less than three prestigious accolades at the County Durham Environment Awards. As well as winning in the 'places and spaces' and 'built environment' categories, the park was also given an 'outstanding' award by the judges. 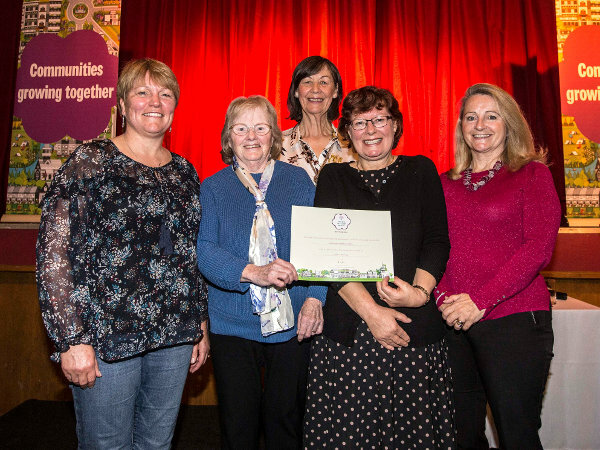 In 2017, at the Northumbria in Bloom awards ceremony in Gateshead, the Friends were presented with the 'It's Your Neighbourhood Award'.